this was a strange book. it was a mix of memoir & journalistic reporting on the unregulated nature of assisted reproductive technology in the united states, but the author was much better at the journalism aspect. there's a lot of memoir in this, & pretty much all of it is unbearable. she starts with a long, detailed explanation of how she met her husband, all the times they broke up, what happened when he married someone else, all the time she spent drinking herself into a stupor & dating scrubs...are you getting the picture yet? once she finally settles down with her husband, michael, she becomes a really unbearable upper-middle-class east coast liberal white lady who goes on "creativity retreats," waxes poetic about how her yoga devotion really helped her through the more difficult times in her life, & how she chose her animal totem. for all the insight that zoll brings to the business of assisted reproductive technology, it doesn't seem to occur to her once that a white lady burning sage & communing with her animal totem is possibly a touch appropriative, at best. the timeline is also confusing. she claims that she woke up on her 40th birthday & decided she was ready to try to have a baby. she & michael did things the old-fashioned way for six months & then miriam got sick & they had to take a break "for over six months". when she picks things up again, she says she is "almost 41." how does six month plus over six months equal less than a year? there's a lot of fuzzy math like this in the book. i mean, i get it. she's writing about things that happened years earlier, & when you are focused on trying to make a baby & you're not having any luck, the months start to blend together & it's easy to lose track of time. but it read like the book had simply gone to press completely unedited. i also haaaaaaated the author's digressions about her family. she builds it up a lot in the start of the book, with all this talk about how she waited so long to take the plunge into starting her own family because she's had such a miserable childhood, one that she "barely survived" (that's a real quote), she didn't think she would be any kind of decent mother. when someone claims that they "barely survived" their childhood, you expect something a little more dramatic than what you get here. basically, zoll's father was a bit of an authoritarian. zoll's parents didn't handle her brother's bedwetting problem very well. zoll's father didn't approve of her sister dating a boy of a different faith. zoll's mother didn't seem to enjoy being a housewife. that's it. no one was locked in a closet or pimped out to drug dealers. by all accounts, she had a pretty typical middle-class upbringing, but maybe somewhere along the way, she got the idea that it's cool to hate your parents & she just ran with it all the way into middle age. honestly, it made her sound incredibly whiny & over-dramatic, which cast an unflattering patina of hysteria over her personal accounts of her experiences with ART.the book makes the excellent point that ART clinics are largely unregulated & often sell clients a very expensive bill of goods, tweaking success rates to offer clients a tiny tendril of hope in exchange for thousands of dollars. i can get behind all that. i doubt that there's anyone in the thick of fertility treatments that wants to hear this or would really listen, but it's good that this perspective is out there. i just wish it wasn't mixed with so much personal whining. This is not my normal sort of book. In fact, I kind of disliked it. It's in the genre of self discovery memoir, in this case centered around the author and her husband's quest to have a child.What I disliked about it is that while emotions are important in a book exploring the emotional roller coaster of excessive promises and failed expectations that are so common — and so rarely talked about — in the fertility industry, Zoll rather overdoes it. Do we really need the long diversions into the author's childhood or her brother's ongoing life as a deadbeat? Do we need to hear about her journey to find her animal totem? While some mention of the author's background is necessary to understand the emotional process the author was going through, it seemed like every chapter was more than half general musing about the author's past, family, and insecurities. The book could have been half the length and still have painted an effective, personal, and emotional picture of the author's journey.That said, the book contained a lot of information that is valuable to anyone who is curious about the fertility industry — and since my husband and I have been trying for a year and a half to become pregnant with no success, we certainly had curiosity (hence the 2 stars).The largest lesson is that the media and general societal attitudes have hugely misinformed women when it comes to their fertility. A woman's fertility drops dramatically after her mid-thirties, precipitously after age 40, and even the best technology relies largely on luck for a woman whose body is just no longer going through the right physiological processes to support egg production and pregnancy. Birth is not impossible — not even uncommon — but it is much more difficult. The various fertility assistance techniques, in vitro fertilization (IVF) and donor eggs in particular, have a much lower success rate than our societal folklore would lead us to believe.The second largest lesson is that the fertility industry is just that, an industry, and it does not — or at least did not for Zoll and her husband — do a good job of supporting the emotional experience of the couples involved.Overall, this was a worthwhile read, although I suspect that there is a book out there — written or to be written — which can convey much of the same experience without being so annoying. I wish I'd had this book 15 years ago. Miriam Zoll shines a much needed light on the opaque, unregulated and increasingly profit-driven fertility industry (it is $4B and growing). Through her beautiful, poignant language and insights readers experience the torment that couples face when moving down the path of treatment and the heaviness of weighing options that even in our most rational states are difficult to navigate. In a powerful narrative, Zoll challenges conventional wisdom about what fertility medicine can achieve and raises important questions about the lack of oversight -- especially given the health risks for those involved in fertility treatment (donors and surrogates included). She also highlights the dubious marketing of risky procedures to those at their most vulnerable. Cracked Open weaves together the complexity of biology and the emotions that accompany failed fertility treatment. It also makes abundantly clear the need for standard protocols and longitudinal health studies. I've barely put this down. Anyone who is going through IVF, or who knows anyone who is, will really gain from reading it. It is a real eye opener into this growing industry too. I really wanted to like this book. 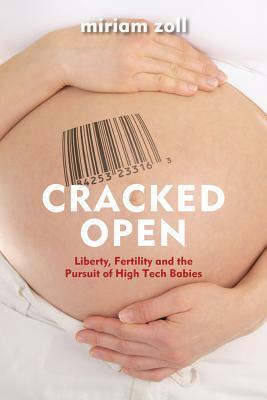 The foreword is extremely thoughtful and gives the impression that Cracked Open will be a feminist, political, theoretical memoir about the fertility industry. The reviewers in the front matter suggest the same. It's a topic I'm interested in and an industry I have problems with. But...I did not like this book. I understand that memoirs are the story of human lives, but it is important that they also consist of a thread of common experience in the life of the author. Cracked Open did not successfully thread me along Miriam Zoll's life. At Zoll portrays herself as uninterested in having a child until she realized she wanted a child in her 40th year. Other times, Zoll berates the media and medical establishment for suggesting that she'd be able to get pregnant at an older age and so it was fine to wait. Was she waiting, though? Because at the times when she heard those things, she didn't want kids and didn't have a partner with whom she wanted to have them. The book was essentially good, but it brought me out of reading it in too many ways to say it was a good book. I was uncomfortable with how she described the dynamic of her relationship with her husband. The dialog was often stilted (and made me think "I wonder if that's what this person really said", never good for a memoir, considering that it seems likely that none of the dialog is in fact what was truly said). The author credits some improvements in her state to psycho/theraputic methodologies that are not evidence based. The question of how the couple afforded their fertility treatments was glossed over too much for its importance to her overall point. There were entire sections that were so self-indulgent that I had to skip over them. Overall, it is clear that Zoll has a solid writing voice, a talent for metaphors, and can weave a story together. Unfortunately, I'm not sure if she was able to get enough distance from this story to do it justice. Ms. Zoll's book was excellent; extremely well-written and engaging. I had a hard time putting it down. The book shines a necessary light on the realities of reproductive medicine that you won't get from the medical providers. My son was born as a result of IVF, and my treatment was rushed and impersonal -- there was not much time for "hello", let alone a realistic discussion of my chances of conceiving and alternative options such as fostering or adoption. I was fortunate enough to conceive on the first try but I realize that the odds were stacked against me as a 37-year old woman who only produced four ova.Some reviewers lamented Ms. Zoll's discussion of her relationship with her husband and her childhood. It was obvious to me that Ms. Zoll included these aspects of her life to paint the picture of what led her to considering pregnancy so late in life and subsequent fertility treatments. All elements of the book were clearly related and important to the tale of how her quest to become a mother became a merry-go-round intended to fund the industry on the backs of couples at the most vulnerable point in their lives. Ms. Zoll should be applauded for warning couples to remember that reproductive medicine is a business like any other. Do not anticipate that those involved in your treatment will have your best interest at heart. You must be your own advocate and ensure that all of your decisions are realistic and informed. After two years living in this same haze as the author speaks of, the librarian offered me this book. I read it in three days, sneaking moments away from my teenagers to be affirmed in my silent secondary infertility diagnosis. The book has opened my eyes to the business of IVF and other aspects of an expanding family. It helped me understand what exactly my best friend went through when she would call about a failed IVF cycle. I had no idea of the hell she endured over her decades of appointments and disappointments to have her own family. I saved the last chapter of this book for when I was alone in the house, in my quiet bathroom, I was invited into the ending of her story. I do not want to put spoilers in here, but as I was reading and living out my own issues, I was sobbing in my tub for this author. I get it now.Thank you for your book, thank you for the story of the Silver Fox (I have experienced SIX at the six buildings I have been to) Thank you for this walk that you have invited us to share with you. As a woman in my twenties, I found this book eyeopening because my generation is told that we don't have to worry about our biological clocks. We're told that reproductive technology is on our side and we can wait. The truth is that delaying pregnancy can cause involuntary infertility, as the likelihood of pregnancy is seriously diminished beyond the age of 35, even with the use of technology. "Cracked Open" is a refreshingly candid and unflinching account of the heartache of pursuing assisted reproductive technology to try to cure her infertility. Miriam has an uncommon ability to weave illuminating research into a narrative that is both poetic and heartfelt.I am also an anonymous egg donor, and found that this was a fascinating account of what the recipient mother may experience from the other side of the medical curtain. "Cracked Open" is now one of my favorite books. Highly recommended for anyone interested in fertility and reproductive technology. Like many modern women, Miriam Zoll wanted to get her career well-established before she had children. She thought she had plenty of time. Finally married and pushing 40, she was ready. When the natural way didn’t work, she went to a fertility specialist. She soon learned that Fertility Assistance Treatments such as in-vitro fertilization and using donor eggs were not the guaranteed route to parenthood most people believed. This memoir takes us on her harrowing journey to become a mother, trying every possible way. As it tells her story, this book also serves as warning to anyone who thinks technology will lead to pregnancy. Not only is the success rate depressingly low, but no one knows yet what the long-term effects will be. A little long but well-written, this book successfully blends memoir and research and should be required reading for anyone considering procreation after age 35. If you’re looking for a detailed explanation of what it’s like to go through years of fertility treatments hoping for a baby, some data on the likelihood of success, and a blunt assessment of whether most clinics will be forthright about it, this book certainly has it.But Miriam has done so much more than that. This is a brutally honest first-hand account of how to make a family when your own body -- for whatever reason -- just isn’t able to do it. Through it, Miriam courageously takes you directly into her home and family, and leaves you with no doubt that modern science can bring its miracles, but that life will always be first and foremost a human journey of person and community. Zoll honestly recalls her own obsessions, mistakes, and periods of depression during her struggle to conceive. The book’s greatest flaw is that it spends less space on her eventual path away from the depression and the struggle than it does on describing them.Even so Miriam Zoll has succeeded in calling attention to an increasingly common yet under-discussed segment of American life. Her dramatic story should be read by anyone considering a journey into the strange, unnatural land of fertility technology. Sheds so much light on the industry and the tragedy that so many women, couples, and families experience. A good reality to be exposed to as a young woman without any experience in how it all works, providing a better chance to prepare for these reproductive realities. Listen to my interview with Miriam Zoll on The Halli Casser-Jayne Show, Talk Radio for Fine Minds, Wednesday, August 7, 3 pm ET online at http://bit.ly/U4EEMd You will be inspired. Moving book about one woman's personal struggle with assisted reproductive technologies. A cautionary tale for anyone considering this method of conception. A mix of personal account and research, this book questions the myth that women can get pregnant in their late thirties and early forties with ease. It does not offer much else though.